The Tiny Booster GAB-3300 is a light and compact size glow plug ignitor for Nitro Engines, equipped with a built-in push button and timer function for stand alone usage. It is also able to operate automatically with the use of a "trigger" optional cable linked to a Hall sensor and also with a Y cable linked to the Hall Sensor plug of standard Nitro Engines Governors / FBL built in Governors. (Do not use the signal wire in that case). - An automatic fuse circuit will prevent circuit loss and protection of the receiver battery / power supply in case the glow plug would be defective or in case of short circuit on the glow plug wire or terminals. - An overheating protection circuit will shut down the Tiny Booster in case the circuit temperature gets too high (for example with too many repeated attemps to start a faulty engine / wrong fuel line). Once the unit has cooled down, normal operation can be processed. - The 3 different colors leds will indicate the state of the Tiny Booster. 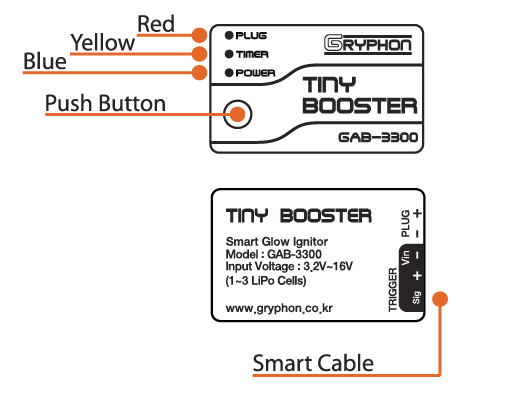 When using the genuine " Smart Cable" from Gryphon, simply plug it to the Hall Sensor of your nitro engine, or to the hall sensor plugof your Nitro Governor / FBL Governor if it has built in governor with a Y cable. The "Smart Cable" will pick up the Hall Sensor signal and will activate the ignition at a pre determinated rotation speed / starter speed and allow the engine to start. The built in timer will prevent continous ignition of the glow plug after the enging is effectively started.